This modern apartment designed by Tatiana Nicol is located in the centre of Paris, France. This apartment has been designed by its owner and designer Pawel Nastanski. It’s located in Warsaw, Poland. This tiny apartment in Stockholm, Sweden had been nothing more than a space for storage for 30 years. This Barcelona apartment renovated by local studio Miel Arquitectos and Studio P10 contains two micro live-work spaces either side of communal kitchen facilities. This is a modern small apartment loft by MAFF. It offers complete features, like bed area, dining area, kitchen, toilet and shower in a small area. 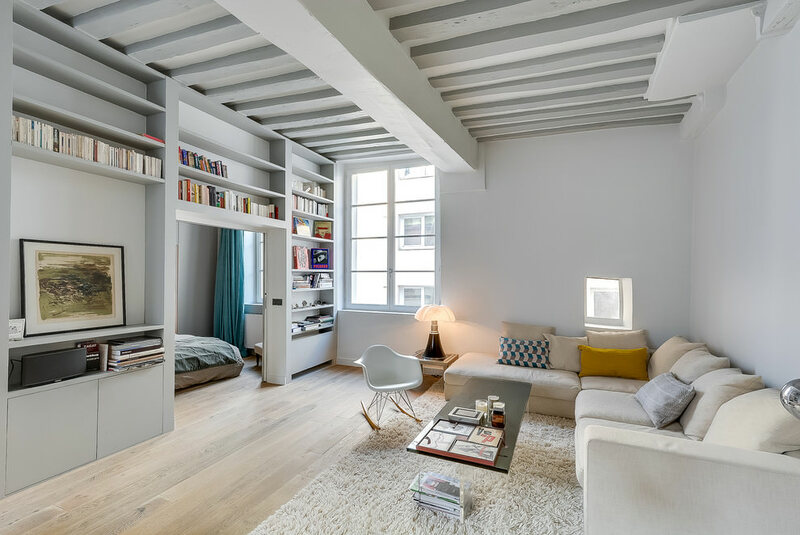 This beautiful, feminie apartment is only 45 sqm (480 sq.ft) designed by INT2 Architecture is a great example, how to utilise such a small space and create functional zones within a particular style frame that are both practical and easy to the eye. Unfortunatelly those pictures are only 3d renderings. One of the problem of highy populated and fashionable city district is the raising costs of property by the square meter. Young people often deal with problem – living in suburbs and having large livings space or just stay in city center and occupy small apartement. Denis Svirid, Ukrainian designer has formed in answer to cramped situation amazing apartemnt with timber walls and snug storage cubbies in Odessa. This apartment belongs to Vincent Kartheiser. He lives in a tiny 580 sq. apartment designed by Funn Roberts. The cabin was designed with a “Japanese-industrial” look in mind. You can find here all you need – suspended bed, open shower space, dining table, vintage teak kitchen and ofcourse eames lounge chair. Do we really need large space to live and feel comfortable? This small apartment, located in Paris, has been designed by September architects. The great challange was to find a solution of giving the rooms the natural light. This reconverted industrial space is long and thin, with windows on one side only and the main task was to bring the generous light from the living area into the other spaces. 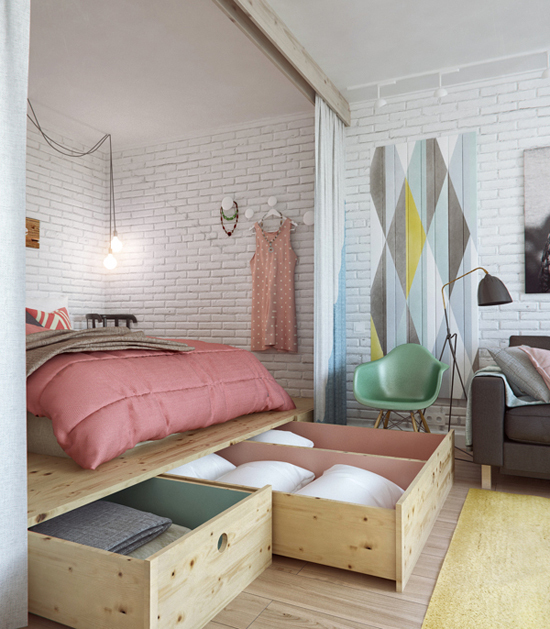 The more space you have the more things you put into, but how about designing a very small apartment? There is definitely no place for things that you don’t need but it’s really possible to design very stylish, modern unclutterd space. Just look at the interior, designed by polish 3AX studio. 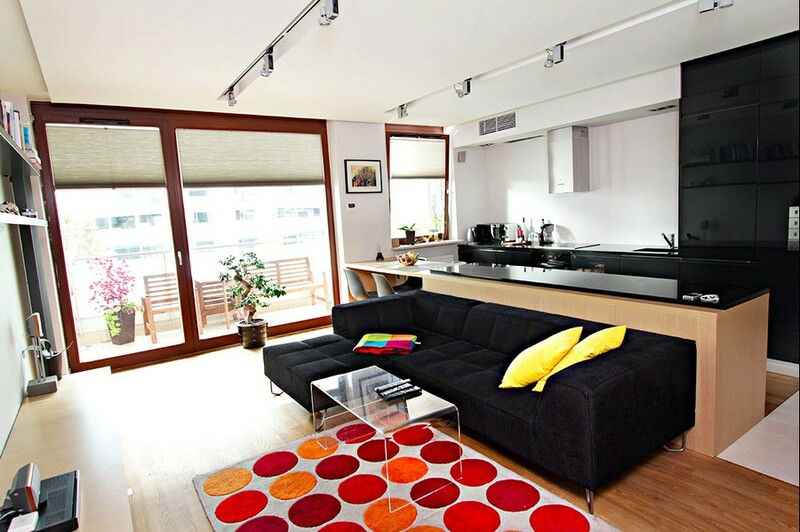 This apartment, located in Wroclaw, Poland is only 312 square feet (29 m2).